Tampa Bay Picked to Host 2014 “Indian Oscars”! The 2013 IIFA’s have just concluded wrapping up in exotic Asian gambling destination Macau, with romantic comedy ‘Barfi‘ taking home a multitude of awards including Best Actor for Ranbir Kapoor. IIFA’s worldwide viewership is 800 million people according to the event organizers. Tampa Bay seems to be jumping onto the Bollywood Bandwagon at the right time as Bollywood Films are estimated to grow to $5 billion in revenue by 2015. The IIFA event itself will consist of film premieres, workshops, fashion shows, and of course the prerequisite red carpet event followed by an awards show. Past host cities for the IIFA Awards including such exotic international destinations as London, Singapore, Toronto, and Dubai. So what do you think readers, is Tampa Bay ready for the likes of Amitabh Bachchan, Deepika Padukone, Priyanka Chopra, Ranbir Kapoor, Shah Rukh Khan, Salman Khan, and all the other stars in the Bollywood firmament? The ‘Expendables 2‘ and ’80’s action star was a special guest at International Indian Film Academy (IIFA) 2013 in Macau and was awarded a prize by Salman Khan. 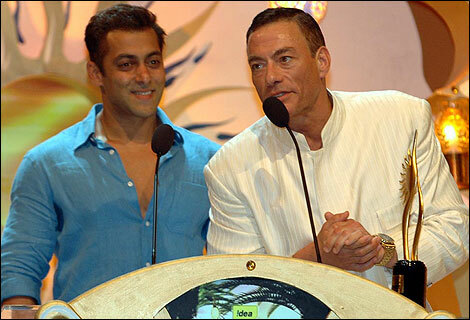 Although he didn’t mention exactly which Bollywood star he had in mind, Van Damme said “We are going to make a movie entitled ‘Luxury Injustice‘. We are here to announce our collaboration with an Indian actor for the film.” The IIFA trip is seen by some as a recruiting trip by Van Damme for his upcoming project. Van Damme is best known for his work as a martial arts Hollywood star in the 1980’s and 1990’s with films like ‘Bloodsport‘ ‘Lionheart‘, and ‘Timecop‘.